We bid a temporary goodbye to two sets of friends lately, both of whom are traveling to exotic places. Ashley and Cade are off to Cuba. (That’s Coo-ber, if you’re as old as we are, and remember a certain U.S. President.) This isn’t the first time they been away on assignment. They have also been posted in Azerbaijan, Budapest, and Russia. They picked up their two little girls in an orphanage in Budapest, which has to rank among the more unusual souvenirs to bring home. Now their souvenir daughters are growing into crazy Americans. Whenever I see the little girls, who chatter like any other girls you would observe in any mall in America, I wonder if they have any comprehension how different their lives are — bouncing from one communist country to another the way most of us would move from a subdivision in one part of town to a place in another part of town where the houses are a little bit newer and nicer. The older one may never think twice about those years in the orphanage. The other one — well, I’m not so sure. As she gets older, she may wonder how the kids thrived who were not adopted as she and her sister were. Did they stay in the orphanage, going out to work at an early age? Did they ever know the love of a family? Did they stay together with their siblings, as she did? Did they find the Church? 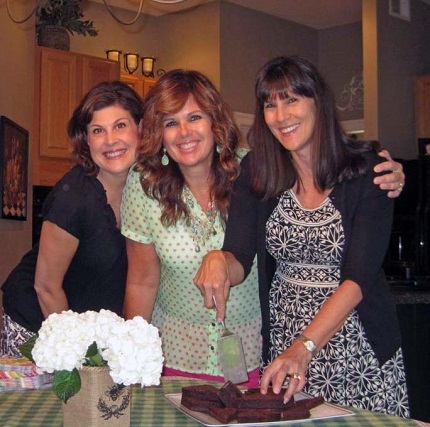 We had a quiet going-away celebration for Ashley and her daughters. (Cade was off training in Costa Rica, whatever that entails.) We decided to get them ready for Cuba by making Japanese gyoza and Chinese fried rice. The girls used the dumpling presses and had a grand old time. They even liked the food, which was a bonus. We’ll miss them, but they’ll be back in two years. Then? Well, I have no idea. They are running out of communist countries, and Ashley refuses to go to Korea. She says Azerbaijan is as close as she’s going to get. She’s thinking of a place that’s shorter on communists — maybe Melbourne, Australia. Her daughters don’t know much about Melbourne. Fluffy and I, who have been there, told them that although Melbourne does not have many communists, it does have a variety of marsupials. The older daughter was nervous about that. She informed us that platypuses are venomous, which I had long ago forgotten. When we told her that Melbourne has penguins, it was all systems go. Melbourne is back on the list. After Cuba/Coo-ber, and after a little time back in Virginia to decompress, their next stop may be Down Under. Maybe we’ll visit them there. By then, I should have my feet and may be able to endure a long plane ride. Right now, the idea of a plane ride of any sort does not sound appealing. We also went to another little celebration for our other friends, Margo and Brian, who are on their way to Kuala Lumpur. They are going to live just a few blocks from Petronas Towers, which I think has got to be one of the coolest things ever. 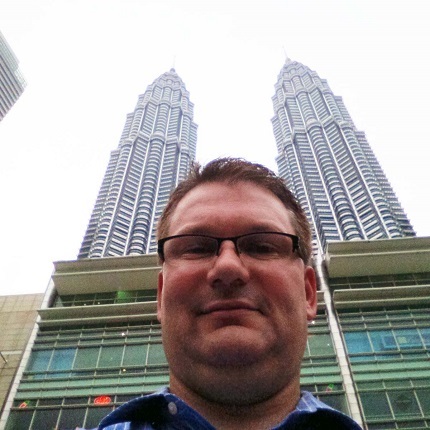 Fluffy and I have never been to Malaysia, or anywhere in Asia, and it would be fun to take a selfie in front of the towers the way our home teacher did, and the way our friend Margo has promised to do, and to send to us when she gets there. In fairness to our home teacher John Karren, he does not normally look jowly. He was shooting to get the Petronas Towers in the background, and the only way he could do it was from the chin up. Once two strong men helped me up the garage stairs and into the house, they parked me in a corner of the kitchen. I overlooked the refreshment table and wielded a camera all night, taking pictures of the festivities. It was a good thing I did, or the evening would have been unrecorded. Margo, on the right, will soon be able to send me her own selfie from the Petronas Towers. A whole bunch of people came to this party. We saw people we hadn’t seen in years. Two of our ward’s four assigned missionaries came to this event, too, obviously with the understanding that, “Where Mormons meet, Mormons eat.” They knew there would be food on the premises, and that the food was going to be free. 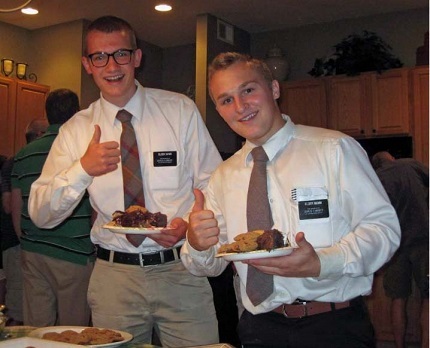 Elder McKay Davis and Elder Jordan Mumm take advantage of a free feed. Like our friends Cade and Ashley, Brian and Margo are not leaving for their first rodeo. They have been traveling for a lot longer, having lived all over Africa and Asia. Brian may be ready to settle down after this assignment. Margo? She still has that glimmer in her eye. Foreign lands may yet be calling her name. Although it is hard to say goodbye to friends, Fluffy and I have known both of these sets of friends for years. We know when they leave for their exotic adventures that they will return, and we will see them again. They may look a little older, and they will be richer in experience, but they will return as essentially the same people they were when they left our little corner of the world. There is one move we will all make, however, to a most exotic clime. This is a move we will make never to return. This is a trip we will all make alone, and people will mourn our loss. Sometimes we will have weeks, months, or even years to prepare for our departure. Other times, it will overtake us as “a thief in the night” (1 Thessalonians 5:2). I almost had my own “thief in the night” experience two years ago. I remember going to the doctor, and I even vaguely remember being put in an ambulance. I do not remember anything after that until two months later. Pay the Discover Card today. Cancel tomorrow’s secret shopping assignment. Let my employers know I won’t be working for some period of time. There was no, “I love you.” There was no — well, there was not anything personal. It was just a grocery list of things he needed to do to keep the house running. And if I had died, which the nurses told my sister would very likely happen, those would have been the last words he would have heard out of my miserable little mouth. Having had my own practice run, I can guarantee you that things have changed in the Kidd household. In our house, the “L-word” is used daily. Each of us lets the other one know he is cherished. Every day he is number one on the priority list, and he knows it. We treat every day as if it were our last day together, because, well, it might be. Life has changed in other ways too. I am trying (and not always succeeding) to live in a way that if I ever have another “thief in the night” experience, I will be ready for it. I will not ever leave Fluffy knowing he is unloved. I will not ever leave unpaid bills or unfulfilled promises or broken commitments. Am I perfect? Good grief, no — I’m Kathy! But I’m a better person than I used to be, and that makes me grateful for the practice run I had that reminded both of us of our mortality. All of us are on a different path, but that path has one common end. Eventually, you and I will all travel down the tunnel of light and meet our Maker. Whether that meeting will be full of joy or full of sorrow is up to us. I think of this path as one of great happiness, and I’m grateful for the bad days as well as the good ones. I hope that whether you have many days to prepare or whether your “moving day” comes as “a thief in the night,” you’ll be happy with your eventual destination. I also hope that you will come to view each day as a precious gift, because it is.